Happy new year, everyone!!! I'm starting off this year with an updated review. 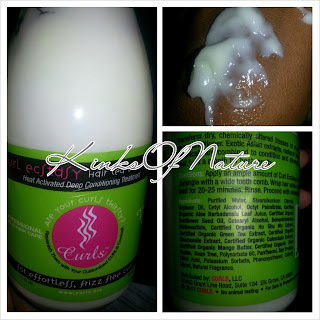 Last year I did a first impressions post on Curls Curl Ecstasy Hair Tea Deep Conditioner (view here); now, I've used it enough to do a full review. Product Claims: Transform dry, damaged, chemically processed or overly stressed hair within minutes! This is the DEEP treatment you've been dreaming of! For best results use with heat! This magical Asian Hair Tea conditioner combines certified organic extracts, exotic emollients with vitamin packed botanicals to moisturize, condition, strengthen and protect your over worked curls. Ideal conditioner to combat the sizzling summer sun and brutal winter winds. If you have dry, coarse, chemically treated and/or damaged your hair...this is the BEST deep conditioner for curly hair! Ingredients: Purified Water, Stearalkonium Chloride, Soybean Oil, Cetyl Alcohol, Octyl Palmitrate, Certified Organic Aloe Barbadensis Leaf Juice, Certified Organic Sunflower Seed Oil, Cetearyl Alcohol, Behentrimonum Methosulfate, Certified Organic Ho Shu Wu Extract, Certified Organic Green Tea Extract, Certified OrganicChamomile Extract, Certified Organic Calendula Extract, Certified Organic Mango Butter, Certified Organic Shea Butter, Bean Tree, Polysorbate 60, Panthenol, Soy Protein, Citric Acid, Potassium Sorbate, Phenoxyethanol, Caprylyl Glycol, Natural Fragrance. 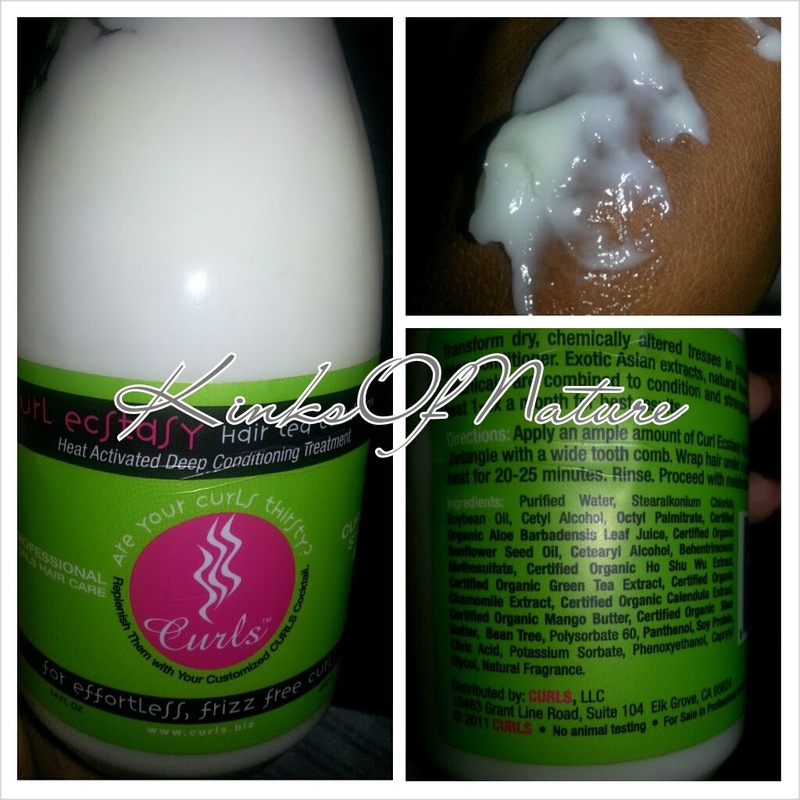 Thoughts: Curls Ecstasy is a thick and creamy conditioner that applies very smoothly. You have to really shake and squeeze that bottle to get product out. I wish it came with a pump or in a jar. It's that thick! I love it though. It leaves my hair so soft and moisturized. Even on the worst wash days, when I've got a week or two's worth of gel piled on and had to shampoo multiple times, this works without fail to rejuvenate my hair. Even while applying, it just instantly smooths my strands. The smell is great too; it fluctuates between Tang and tea. Weird description, but depending on the day, that's how it is for me. Mahisha, the owner/creator of Curls, recommends also using Curl Ecstasy as a leave-in. I've tried it, and again loved it! It works best for me when I use it as a deep conditioner and partially rinse. I apply an oil on top to seal and continue with my styling process. The one thing that keeps this from being a holy grail product for me is that it's not a good detangler. It works fine if my hair was recently detangled, but I can't use this in my detangling step if I've skipped a week or more of detangling. Curls Curl Ecstasy Hair Tea Deep Conditioner retails for $20 (14oz) and is available on the official Curls site, online retailers, and brick-and-mortar stores. Would I repurchase? Yes, but only during a sale and preferably a BOGOF.